Bring snacks along with you before you get on the plane, boat, etc. This will ensure that you won’t get overly hungry and will have nourishing food with you. Once you get to your destination, visit a farmer’s market or grocery store to pick up additional healthy snacks to have on hand. Lisa Stollman, MA, RDN, CDE, CDN, CLT is an award-winning Registered Dietitian Nutritionist who is passionate about helping people transform their lives with optimal nutrition. She received the 2015 Outstanding Dietitian of The Year from the Academy of Nutrition and Dietetics. Lisa is an entrepreneur, food influencer, speaker, private practitioner, and writer. She is the co-author of “Making Nutrition Your Business,” 2nd Edition, Eat Right Press 2018.. In addition Lisa is the author of the ebook The Trim Traveler: How to Eat Healthy and Stay Fit While Traveling Abroad (Nirvana Press 2014) and The Teen Eating Manifesto (Nirvana Press 2012). In her private practice she specializes in teen and adult plant-based nutrition, food sensitivities and diabetes. She consults with clients in Huntington, New York, on the Upper East Side of Manhattan and virtually. To find out more about Lisa or to book an appointment, please visit here. February is National Heart Month so it’s a perfect time to start paying more attention to your heart. Practicing positive self-care should also include being attentive to your heart and what it requires to be healthy. Incorporating a healthy lifestyle routine into your daily life will provide an array of health benefits for many years to come. A healthy lifestyle routine includes eating well and exercise on a daily basis. When it comes to heart health, it’s good to know how nutrition can be a powerful influencer. Read the four tips below to enjoy the benefits of a healthy heart! Choose heart-healthy monounsaturated fats in place of saturated fats. These healthy fats include, olives, olive oil, avocados, nuts, nut butter and canola oil. Saturated fats (butter, animal fats, cream, whole milk) should be used sparingly. Avoid trans fats. These fats include fried foods (sorry French fries and donuts! ), stick margarine and Crisco. Eat more plant-based meals. Swap the beef burger for a veggie or Portobello mushroom burger. Grill tofu and add that to your salad in place of grilled chicken. Enjoy a peanut butter sandwich in place of the usual ham and cheese. Load up on fiber. Fiber helps lower cholesterol. So swap out the white bread for whole grain. Add beans to your soups and salads. Prepare salads and side dishes with quinoa, sorghum and farro. Add a tablespoon of chia seeds to your cereal or yogurt for an extra five grams of fiber. Lisa Stollman, MA, RDN, CDE, CDN is an award-winning Registered Dietitian Nutritionist who is passionate about helping people transform their lives with optimal nutrition. She received the 2015 Outstanding Dietitian of The Year from the Academy of Nutrition and Dietetics. Lisa is an entrepreneur, food influencer, speaker, private practitioner, and writer. She is the co-author of “Making Nutrition Your Business,” Second Edition. In addition Lisa is the author of the ebook The Trim Traveler: How to Eat Healthy and Stay Fit While Traveling Abroad (Nirvana Press 2014) and The Teen Eating Manifesto (Nirvana Press 2012). In her private practice she specializes in teen and adult weight management, plant-based nutrition, food sensitivities and diabetes. She consults with clients in Huntington, New York, on the Upper East Side of Manhattan and virtually. To find out more about Lisa or to book an appointment, please visit here. If you have prediabetes, hopefully you’re familiar with strategies to lower your blood glucose and avoid the development of diabetes down the road. Making smart food choices and exercising regularly to keep blood glucose levels within normal range are key strategies for staying healthy. These lifestyle choices should be practiced during your daily routine, but can also be easily incorporated into your plans while traveling. It can be tempting to savor new foods and indulge on sweet treats when you’re away. Eating mindfully while you travel will let you enjoy a variety of foods, but continue to keep your blood glucose in check while you’re away. If you have questions regarding your diet while traveling, meet with a registered dietitian nutritionist (RDN) prior to your departure to gain more knowledge on foods and physical activity that can keep your blood glucose within normal range. If you check your blood glucose at home and are still working on getting it into a healthy range, bring your glucometer with you so you can stay on track when you travel. Avoid sugary drinks. Drinking sweetened beverages is a quick way for blood glucose levels to rise. Instead of sodas, juices, and sugary coffee beverages, enjoy water, seltzer, or unsweetened tea or coffee. For breakfast, skip the sugary cereals and baked goods. Try some oatmeal or plain yogurt with fresh fruit, or egg whites on whole grain toast. Bring some packets of plain oatmeal with you and a bag of nuts or energy bars, such as KIND, so you have healthy choices readily available. Make sure you eat balanced meals. Fill half of your plate with fruit or vegetables, and include whole grains and lean protein, such as tofu, beans, grilled fish, veggie burgers, eggs or chicken. For dessert, try to order fresh fruit or some plain yogurt and fruit. If you order something sweet, try to keep your portions smaller (eat mindfully and she with your dining companions). Make time for exercise everyday. An easy way to do this while traveling is to walk to some of your destinations. Aim for 30 minutes of brisk walking per day. Be smart about your snacks. Do not just grab the most convenient snacks; choose them wisely! Between meals, enjoy a fresh fruit, vegetables with hummus or some nuts. Stock up on some of these snacks before you leave home, and visit a local market at your destination, so you always have a healthy snack on hand. Lisa Stollman, MA, RDN, CDE, CDN is an award-winning Registered Dietitian Nutritionist who is passionate about helping people transform their lives with optimal nutrition. She received the 2015 Outstanding Dietitian of The Year from the New York Academy of Nutrition and Dietetics. Lisa is an entrepreneur, food influencer, speaker, private practitioner, and writer. She consults with food startups and restaurants to help put health on the menu. Lisa is the author of the ebook The Trim Traveler: How to Eat Healthy and Stay Fit While Traveling Abroad (Nirvana Press 2014) and The Teen Eating Manifesto (Nirvana Press 2012). In her private practice she specializes in teen and adult weight management and diabetes. Lisa received her two degrees in Nutrition from New York University. She consults with clients in Huntington, New York, on the Upper East Side of Manhattan and virtually. To find out more about Lisa or to book an appointment, please visit here. With Memorial Day kicking off this weekend, summer is officially here. So I thought it would be wise to offer some advice on how to eat well at the endless array of BBQs destined to mark your calendar during the upcoming summer months. These gatherings are a great way to get together with friends and family, enjoy the weather, relax, and just enjoy life. You’ll typically be faced with a smorgasbord of food options, so trust that you can still get your fill and also feel good about what you are eating. Here are five tips for you to take to your next gathering. Condiments: Go easy with the mayo, creamy dressings and cheese you consume. For a healthier alternative, try a couple slices of avocado. Bulk up your burger or sandwich with as much lettuce, onions, tomatoes and pickles as you desire. Sides: Go heavy on the salsas and fresh vegetable options; go lighter with the mayonnaise-based sides, such as macaroni salad and dips. Don’t overdo the chips, as they are empty calories that won’t fill you up. Opt for crackers, pretzels or baked chips and aim for one handful. If raw vegetables are being served, indulge in them. They are always the BEST choice! Desserts: Limit to one small portion if it’s a decadent dessert. If there is fresh fruit, that’s– hands down– the better choice! What to bring: A watermelon (everyone will love this! ), vinegar-based coleslaw, salsa, hummus and raw vegetable tray, chickpea salad, salad with fresh nuts and berries with vinaigrette or fresh fruit salad (this is my personal favorite!). While these are all healthier options, if it tastes good, people will eat it. Eating Healthy and Staying Trim in the U.S.V.I. Sit back in your chair and close your eyes. Picture white sandy beaches with water the color of clear, cool aquamarine. Colorful fish you can see simply just standing on the beach. Yes, the water is that clear. The rhythm of the day drops a few notches down from what you are used to at home. You have arrived in the U.S Virgin Islands. It’s a great place to visit for unwinding and enjoying nature. And the beautiful climate, lovely people and delicious Caribbean food pull it all together to have a uniquely memorable trip. If you are like me, when you travel you want to enjoy the local food, feel great, continue to stay fit and avoid coming home with extra unwanted weight. The goal during a vacation, even if you’re trying to lose weight, is weight maintenance. Don’t try to lose weight when you are away. Enjoying the local food is part of the experience. But be mindful when making food choices. That is always key to good health. Read below for my tips on healthy eating in the USVI and staying fit. The USVI includes St. Thomas, St. John and St. Croix. For this blog, we will limit our exploration to St. Thomas and St. John. We hope to cover St. Croix on another Caribbean trip. Try to avoid fried foods, which are aplenty on these islands. Ask for grilled fish and chicken, instead of fried. Ask for salad or vegetables in place of the French fries. Portions are large in the USVI. 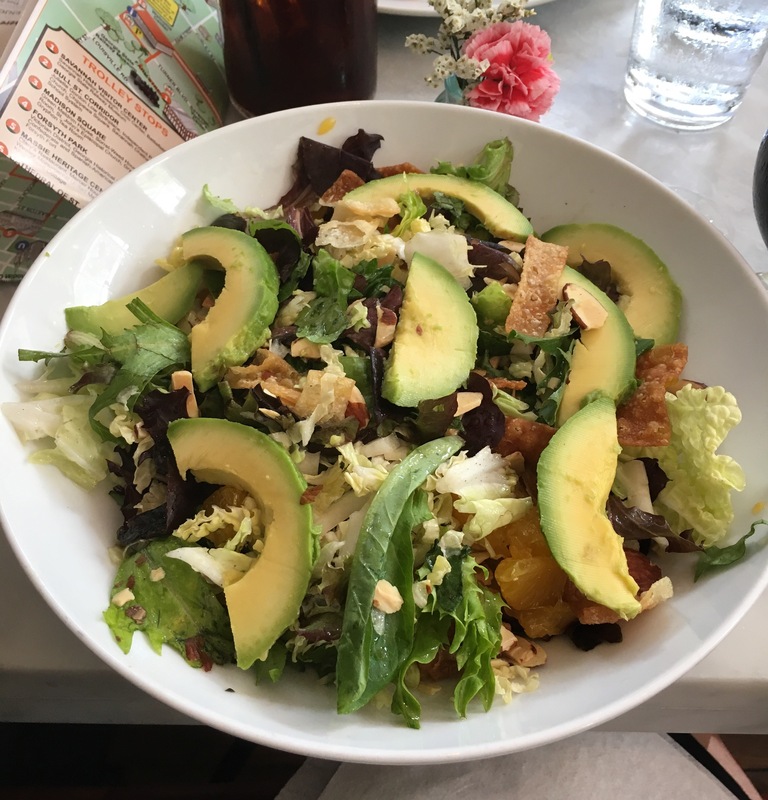 To keep calories down, share a salad and an entree with your dining partner. Choose more salads, grilled fish and vegetable-based dishes when you travel here. For dessert, order fresh fruit. They grow many delicious fruits here, including mangoes. Yum. Go easy on the alcohol. Yes, these islands are known for their rum and it is abundant. Instead, save your calories, and enjoy seltzer with lemon and a splash of juice. Go for a hike. These islands are covered with lush greenery and trails. Or walk the beaches. Swim and snorkel. The water is gorgeous and the sea life is amazing. Think colorful fish, sea turtles and stingrays. Walk through the towns and take in the amazing history of these beautiful islands. Jen’s Island Cafe (St. Thomas) Amazing curries and other Indian dishes. Many vegan options. Highly recommend for a casual lunch while strolling through the picturesque town of Charlotte Amalie. Mafolie Restaurant (St. Thomas) The food is delicious Caribbean cuisine with many plant-based options. The restaurant is located cliffside and the view is beyond outstanding. ZoZo’s (St. John) Simply the best restaurant in St. John. Terrific Italian dishes with an emphasis on fresh seafood and vegetables. Conclusion: The USVI is a fabulous place to unwind and enjoy nature. The local people are so friendly and the weather can’t be beat. And the beaches…..they have the most beautiful soft, white sand and are lush with palm trees. Many restaurants offer delicious local produce and fresh-caught seafood. What more could you want when you need a little R and R? We highly recommend this travel destination. Traveling abroad with celiac disease or gluten sensitivity may pose a challenge at first. But if you do your homework before you leave home, you may find it quite manageable. The key is to do your research so you are not left starving or unsure if what you are eating is in fact gluten-free. And very important, especially for those with celiac disease, make sure you are well-versed in avoiding cross-contamination with gluten. If you feel that you are lacking in basic celiac disease nutrition and how to order in restaurants, meet with a Registered Dietitian Nutritionist (RDN) who specializes in celiac disease before you leave for your destination. You can find a RDN to help you on The Academy of Nutrition and Dietetics website. Don’t let your diet restriction stop you from enjoying this amazing experience on which you are about to embark! 1. Food customs: have an understanding of how traditional dishes are prepared and the ingredients used so you know what is gluten-free, what to avoid and what can be modified. 2. Language: be able to communicate your needs and identify key words that indicate sources of gluten. Have a smart phone? Download a translation application to ease the language barrier. Google Translate is a user friendly app. Although English may be spoken as a second language in your city of travel, it is unlikely the word gluten or celiac is understood so know the translation in the area’s primary language. An excellent resource for gluten-free dining out is the app GF Card (free for iPhone or iPad) which contains gluten-free dining cards in fifty languages. Simply show your iPhone to your server. If you don’t have an iPhone, visit http://www.TriumphDining.com to order gluten-free dining cards. 3. Locale: know where you can stop in to purchase packaged snacks or fresh fruits to fuel your travels. If you are staying in a place with a kitchen it may be a good idea to stock up on gluten-free dried pastas, bread, cereal, quinoa, crackers and rice to break up the meals eaten out. Pack gluten-free snacks to avoid searching aimlessly for gluten-free options, taking away from valuable sightseeing time. Airports are also a great spot to stock up on healthy packaged snack foods. KIND bars, NuGo Free Dark Chocolate Trail Mix protein bars, dried fruit and nuts are some examples. Dehydrated rice noodles, bean soups and gluten-free oatmeal packets are easy to carry along and just require hot water, easy to come across in most hotels, cafés or corner stops. Look for gluten free wraps you can carry along so you can simply request the sandwich fillings be made in your wraps and even bring along plastic gloves just in case. Know that continental breakfasts will unlikely have gluten free breads/cereals and the risk for contamination is likely going to be quite high. Yogurt, cheese, peanut butter, eggs and fresh fruit are good options for breakfast when dining out. Before booking a hotel, it would be wise to ask if special arrangements can be made. Request to have a small refrigerator in your room. Stock up on inexpensive grab-n-go breakfast food such as gluten free granola bars, dried fruit and rice cakes with a nut butter spread. For eating out, research the area beforehand to find those restaurants which will accommodate the gluten-free traveler. Look on the Internet for restaurants which serve gluten-free dishes. Choose those places that understand risk of cross-contamination. 1. Make sure your meat is cooked on a clean surface, meaning not the same grill where bread/buns are toasted. 2. Make sure the vegetables have not been cut on the same cutting board as any flour products. 3. Gluten free pizzas need to be cooked on clean surfaces and gluten free pasta needs to be boiled in clean water, not the same water previously used to cook wheat pasta and the same thing goes for any fry order. 4. Tip generously especially if the restaurant or café makes special plates and is very accommodating. This will only encourage similar behavior for the next traveler. Gluten-free in major cities abroad: Do some research online before you travel, so you have a list of GF dining options in your locale. Below are some of the GF establishments that we found in our searching. Italy: the land of bread, pasta and pizza is very welcoming to the gluten free traveler. The Italian Coeliac Society certifies restaurants claiming gluten-free on their menu to assure the consumer there will be no risk for cross-contamination. Paris: Many restaurants and bakeries offer gluten-free fare. Here are a few recommended choices. A terrific website is www.glutenfreepassport.com for finding info on restaurants, traveling tips, travel language guides and a variety of gluten-free and food allergy apps. Take the time to review it before you embark on your trip. For more specifics by country: if you are traveling to Mallorca, France, Indonesia, Bolivia, Chile, Easter Island, Thailand, Finland, Australia, Montreal, Abu Dhabi, Sweden, Italy, Columbia or Sri Lanka just to name a few, here are stories from gluten-free travelers.